The ideas that fell out of Stan Lee’s head seem to have come to RULE THE WORLD! Characters such as Spider-Man, The X-Men, Thor, The Avengers, and Iron Man entertain millions of fans across numerous mediums. As an editor he faced the hard choice of taking Jack Kirby off of his newest creation, Spider-Man, and giving the assignment to a young man named Steve Ditko. As a speaker he is hired for a single speech but often gives four or more without a complaint. Stan Lee is one of the most important figures in the history of 20th century media. It is no small feat to change an artistic medium, but Lee changed the way comics are written and read. 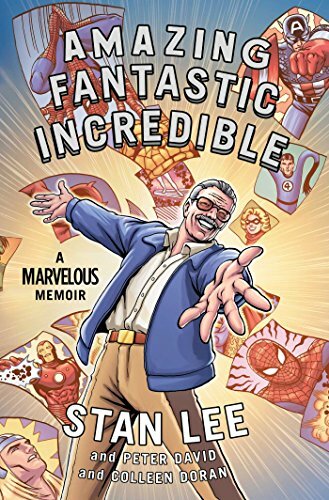 Amazing Fantasy Incredible: A Marvelous Memoir isn’t so much the story of how Stanley Lieber became Stan Lee, it is how Aesop, P. T. Barnum, Lee Iacocca, James Joyce, Henry Ford, and a bit of both Tony Robbins and Billy Graham can all exist in one man. As only fitting the life of a man who has spent 70 years in comic books, Lee tells his story in graphic novel format. Working with co-writer Peter David and artist Colleen Doran, he explodes out of the book on the very first page with open, welcoming arms. His smile is as wide as Teddy Roosevelt’s, and his warmth is genuine. The Depression shaped his early years. His father struggled with work and his mother was doting and overly attentive. She took pride as he lost himself in the worlds built by Twain, Wells, Verne, and Shakespeare. Equally important to the development of young Stan was that Mrs. Lieber not only allowed Stan to read such books such as The Hardy Boys, Tarzan, and Tom Swift, she encouraged him. This early mixture of the classics and what many of the period considered the “junk” literature would give the older Lee a leg up on storytelling. After a series of youthful jobs, Lee finds that an uncle might have a job inside a publishing company. The young Stanley Lieber goes to the office and finds out that the company, Timely Publications, also publishes the brand new comic book sensation, Captain America. “Are they like comic strips?” comes the young novice’s reply. A second later Simon’s partner Jack Kirby appears with a massive, outstretched hand welcoming the young man. Neither knew it at the time, but the two men are fated to create a world of mythology so dense, detailed, engaging, and engrossing that billions of dollars will be made on their work. Lee and David are not telling a hyper-detailed story here. Creating comics is work, hard work, and problems arise. Certain stories, such as Kirby and Simon’s first departure from Timely, are glossed over quickly. Yet he doesn’t avoid conflict or debate when it happens. Stan openly acknowledges that, at least part of the reason for the creation of the Comics Code Authority in the fifties, was to put Bill Gaines, publisher of EC Comics, out of business. Stan says that in the fifties, even without the Code, he was very conscious that kids were reading the stories he was writing and editing. He kept his content character driven, a style choice that was about to pay off in spades. Lee acknowledges his own personal communication problems with Kirby and others he has worked with, but never goes into deep detail. This is a celebration, not a mud fight. Lee knows full well how much Kirby, Steve Ditko, and others have meant to his life. During a moving, two-page tribute to artist Joe Maneely, an artist he worked with extensively in the 1950s and one of the forgotten greats of the art form, is moving, and Lee speculates about what the world of Marvel might have looked like if he hadn’t had died so unexpectedly. Writers Lee and David challenge artist Doran on every page. Currently the artist on Justice League 3001 as well as cover artist for The Walking Dead and the creator of A Distant Soil, she ups Lee and David’s narrative as she slips photos, charts, advertising, original cover art and panels, portraits as well as an occasional touch of Tex Avery’s exaggerated reactions into the story of Lee’ s life. Wrapped around the stories of how he created iron Man, Spider-Man and host of others or how he met the Queen of England or any number of presidents, are found the quiet moments of a person’s life. Lee, David, and Doran tell of hos a year after the birth of his first daughter, the second child of Stan and Joan Lee sadly never leaves the hospital after being born. As Lee tells us of the loss he stands in darkness, the lower half of his body unable to seen in the black. He is a man cut in half. His arms are open as he begins to tell us the simple outline of the story. In the next two panels Doran pulls us close to reveal his face in grief. The artist then pulls away over the next three panels until Lee is once again seen in half darkness. This time his arms are at his side, he has fought as best he can against what happened. In the end, what can Stan Lee teach us after all these years? Well, for one, never visit the White House with an actor dressed as the Green Goblin . . .
Now in his 90s, Stan Lee knows his life is magic. With help from David and Doran, (Lee always functions best with others . . .) he may not show us all the details like Penn and Teller, but he sure WOWS us with the tricks.